One of the dubious benefits of economy transcontinental air travel is the opportunity to watch “free” movies. I spent so much time with my knees in my face that I viewed several I wanted to see and a couple I tried (and quit) out of boredom. The Book Thief was the best of the lot. Based on the book by the same name (which I also rated five stars). 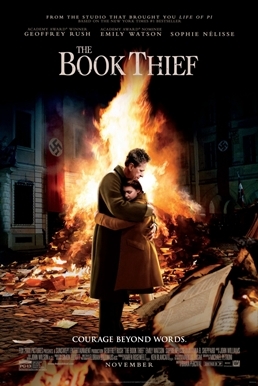 The movie evokes the same childlike—not to be confused with childish—innocence as the horrors of Nazi Germany and the Holocaust develop around Leisel, the “book thief.” The movie follows the book closely enough, but what sets it apart is the cinematography and the performances by Sophie Nélisse and Geoffrey Rush. Nélisse performs the magic of aging half a dozen adolescent years. Rush, as usual, steals every scene he’s in. The man is chameleon and a wonder. Recently released on DVD and Blu-Ray, it’s worth watching.